Balbriggan has become the first location on the east coast to launch free high-speed public Wi-Fi. Powered by Magnet Networks, Our Balbriggan Free Town Wi-Fi is the latest step in the transformation programme which is set to change the face of Ireland’s youngest town. Balbriggan’s town centre will become a free public Wi-Fi zone thanks to a unique initiative that provides locals and visitors with unlimited access to speeds of up to 100mps and could position the town at the forefront of smart technology. The ground-breaking scheme was officially launched today (Monday, April 8) at the Bracken Court Hotel by Mayor of Fingal, Councillor Anthony Lavin. Each Our Balbriggan Free Town Wi-Fi access point can handle 250 simultaneous connections, providing a quality service to pedestrians and businesses within the town centre. There are no limits as to time or data usage and the service also has web filtering for secure access. “The beauty of Magnet Networks’ free Wi-Fi is that you only need to register once, so business visitors and tourists will automatically enjoy free connectivity for their entire stay,” said Magnet Networks Managing Director Ireland Stephen Brewer. The launch of Balbriggan’s Town Centre Wi-Fi forms part of the Council’s wider Public Wi-Fi Plan which sees the rollout of free public Wi-Fi hotspots to town and village centres across the County. The Plan also sees the rollout of the Smart Bench pilot – supported by The Department of Rural and Community Development. A number of solar-powered, Wi-Fi enabled benches with wireless charging facilities and environmental sensors will be deployed in a number of locations across the county, the first of which have been deployed in Balbriggan. The installation of town centre Wi-Fi is the first step in transforming the retail and cultural heart of Balbriggan, according to Prof Brian MacCraith, Chair of the Balbriggan Leadership Group. “As Ireland’s youngest town, we have the highest percentage of digital natives in the country,” said Prof MacCraith. 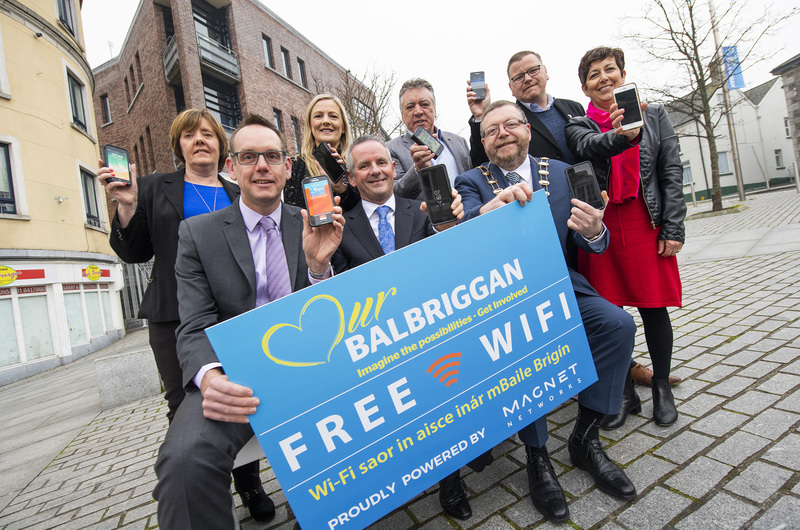 “The free Our Balbriggan Wi-Fi provided by Magnet Networks will be critical to attracting people and businesses to a reimagined town centre and helping us meet future challenges. Mayor of Fingal, Councillor Anthony Lavin highlighted the fact that over 4,000 Balbriggan residents aged over 11 recently took part in the Our Balbriggan survey to prioritise a list of suggested improvements for a €20m-plus transformation of the town. “Transforming the Main Street and connecting it to a reimagined Harbour area topped the board across all age groups in the survey, and our implementation plan will be published at the start of May,” said Cllr Lavin. Magnet Networks free town centre Wi-Fi has been a huge success in Galway where it has provided businesses with a direct line of communication to their customers and given people a reason to spend more time in the city centre. “There will be no one big thing that will change Balbriggan – the town will be transformed by many actions such as Our Balbriggan Free Town Wi-Fi, completed by Fingal County Council, public agencies and private businesses, community groups and citizens of the town over a period of years,” said Fingal County Council Chief Executive Paul Reid.